These are incredible. I can't believe she had only painted for over 3 years! Extraordinary! I agree. Excellent work minniemie. 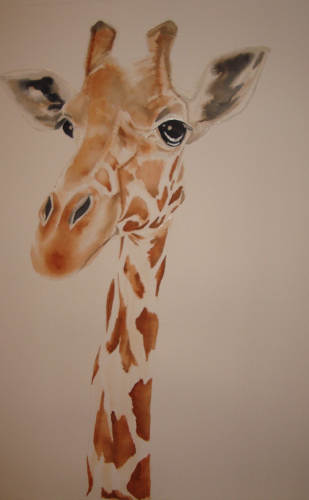 I love all your pieces, especially the giraffe who is a beautiful creature. Great job and interview. It's great to be back on PPF and hi everyone. Missed everyone. Thanks Eva and Kristin. What an fabulous & interesting interview. I don't see any formula work here at all. Its amazing work and to know its only been a short time since you have been painting really adds to the WOW factor. Happy PPF. WOW, Seems I got a long way to go with my animal drawings! Great work! 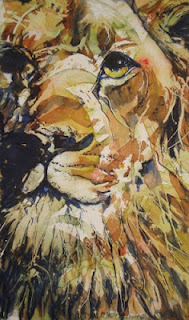 your paintings have a strong sense of the inherent nature of the animal you paint. your style is recognizable as your own and the results are moving and beautiful. your comments on preferring watercolor over acrylic are interesting to me. i work in acrylics and would be terrified to attempt using watercolors. I am so glad to have had a chance to learn more about Minnemie. Wonderful! Minnemie, you are now famous! Your animal art is extremely beautiful! Did you know watercolor is considered the hardest medium to master? Keep up the excellent work. 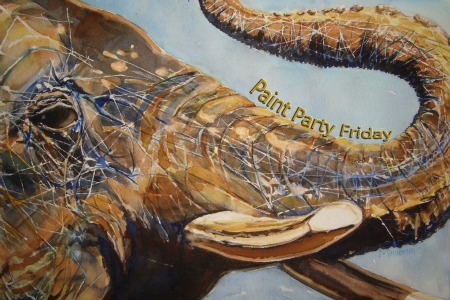 I've been following Minnemie since she started joining in with Paint Party Friday and I absolutely adore her work - obviously the fact that she paints animals plays no small part in that but she paints them so amazingly well!! I think she does manage to let her right brain in because to me, while her work is realistic in that you can clearly tell what the subject matter is, there is also a wonderful loose, free style to it that is very distinctively hers! Great to meet Minnemie here, I am a keen follower of her blog. Smashing to meet Minnemie, I love all her animal paintings they are wonderful. A true talent. I was super eager to add my PPF link and did it from my iphone, only to realise now, that looking at in a browser it is all condensed, so I've re posted the correct url. Is it possible to delete the first one? I love those fabulous animals... I think they're wonderful, thank you PPF for the introduction! I am in awe of Minniemie's work...I have been lucky enough to receive an atc of one of her elephants...the card she sent with it is now framed...her work is mesmerizing, captivating sooooooooo much talent!!!! love all of it! congrats on the interview!!!! so interesting to learn about Minnemie's artistic journey, and 5 little boys...just wow. Thanks for hosting Eva and Kristin! Beautiful interview...Minnemie's work is so brilliant and gorgeous..i love visiting her ! These images are stunning..powerful and magnificent! It's great to learn more about you, as I admire your work! How do you find the time, with such a busy family? Awesome story and paintings! It is so interesting to hear an artists story of how their creative journey began. Thanks for hosting! I'm going to be traveling today, so will be visiting off and on this week. Happy Friday! Thank you for the lovely interview! I find Minnemie's work really fascinating and original! I really love that giraffe you painted. Amazing work! I absolutely love her use of pattern and color. Yes BEAUTIFUL! Great to meet such artists here, such a pleasure to discover. Wow, what a great interview! I am a big fan of Minnemie and have even bugged her by email on occasion. I did not know she has FIVE little boys. I am a bit flabbergasted by this fact. I mean, holy cow! Such wonderful African animals (I suggest she try some of the birds, especially big ones, so fun!) I hadn't seen the bison or the Aslan lion and they are wonderful! And to think it was practically by accident she took a painting class. Thank goodness she did! These small canvases are also my entries for Colors of Summer2. They are small (4x5) canvases. Didn't have a lot of time - but really wanted to create something! Happy PPF everyone. Wow this girl's work--absolutely incredible. Better than photos if that's possible. Looking forward to seeing more of her paintings. Thanks to all for your kind words and great encouragement both here and on my blog. It is worth saying again: You help me pull out the paint (and thus sanity) on those chaotic days. I am thankful for each one of you! I am going to start next FRIDAY, love what you are all doing here- see you soon. YAY! I'm a BIG fan! So great to meet Minnemie here. I was away on vacation last week so I missed PPF. I am so glad I came to read about Minnemie and her journey and adventure into painting. So hard for me to believe that you have only been painting for 3 and a half years Minnemie. Your African animals are magnifcent! I love your art and so glad you mustered the courage to jump in here and share through your blog as well. I think anyone who can raise five sons has to be very brave indeed! Bravo to you!!! Keep it coming. (PS if you haven't met Soulbrush you left a comment here a few up from mine you will enjoy her art and blog. 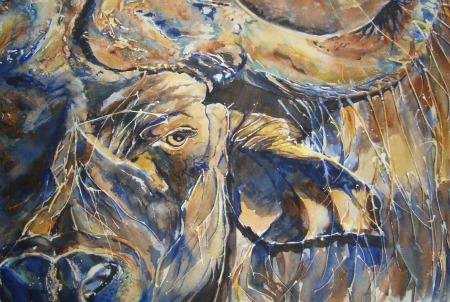 She also hails from South Africa and her art reflects that too.